Are we eating as nutritiously as we can? Eating simple, balanced meals of whole, real foods can make a world of difference in the way everyone feels. Are we all getting quality sleep? Sleep needs vary based on age, but in general, children should be getting anywhere from 9-14 hours per 24 hours and adults need a minimum of 7-8 hours per night regularly to feel recharged. Is our schedule overflowing? If you’ve been saying yes to too many activities, it might be time to pare back and use your days to reconnect and reestablish order in the home. Are we spending time outdoors daily? Outdoor play--whether that’s going for a walk, hitting up the playground, letting the kids make mudpies, or climbing trees--is restorative and a sensory touchpoint for all ages. Is our home generally organized and free of clutter? Every item in your home should have a role and a designated place, otherwise let it go. Does everyone have a role in keeping the home clean? All family members should contribute to maintaining the home on a daily basis. Even the youngest children can help pick-up their toys, dust, and make their beds. What in our home may be overstimulating to our kids and ourselves? Note all of the external sources of stimuli (television, tech devices, noise, and physical disorder) and reduce or get rid of as many as possible. Is our home typically stocked with healthy food and easy meals to prep? Create a consistent game plan for grocery shopping and cooking so that nutritious food is always within reach. What is the general tone of our communication with one another? We need to model healthy and positive communication to our children; are your words and actions sending the right message? Am I taking time to connect deeply with each of my children? Often when our children are acting up, it’s because they need more quality time with us. Reconnect through play, conversation, and listening to repair breakdowns in communication and behavior. In what ways can I deepen my relationship with my partner? Are you finding time to encourage, support, and build intimacy with one another or simply going through the motions? Am I spending too much time on technology and other shallow activities? Evaluate the amount of time you dedicate to technology versus in your home and on yourself. Cull the unnecessary and embrace offline hobbies instead. Am I moving regularly in ways that feel good to my body and give me energy? We all know that regular exercise is important, but do you find other ways to move and challenge yourself physically? But first, take a walk. Daily. Am I nourishing my body with the right foods or I am relying too much on caffeine, sugar, and other temporary fixes? Refined sugar hijacks your brain. And as much as we love coffee, it can negatively impact your sleep, cause adrenaline spikes, and withdrawals. Find ways to cut back on stimulants. Am I scheduling regular time to honor my own needs? Invest in a creative project, cultivate deeper friendships, and set aside time to recharge. If you aren’t taking care of yourself, how will you care for your family and others? Make this one a priority. As we often say on our podcast, we don’t have all of the answers, and we certainly don’t lead perfect lives. 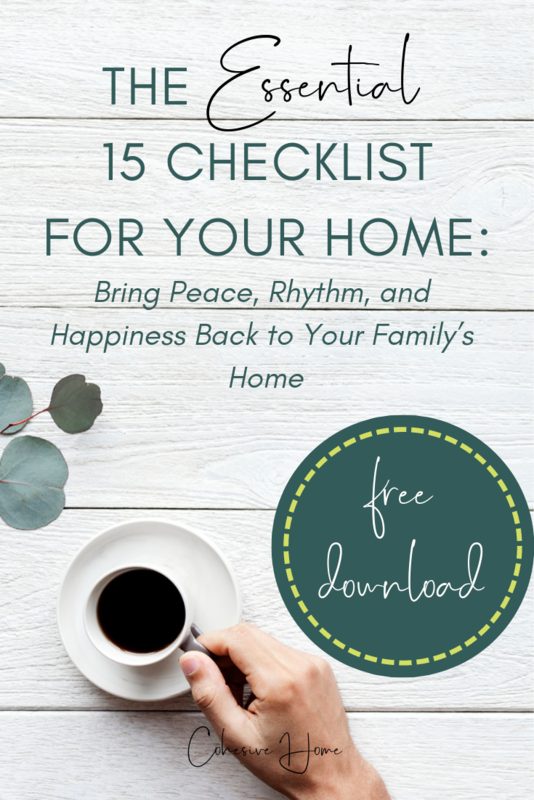 But using this list as a regular touchstone will add a sense of peace to your days, restore rhythm, and cultivate a family culture of happiness in your home. Download your free checklist below.